Many comedians who are involved in stand-up comedy are under the impression that most women comedians are not funny, nor will they likely ever be funny on stage. I not only believe that sort of mentality to be blatantly FALSE, I also believe that there are MORE opportunities available to women who can “deliver the goods” and get the big laughs on stage. I have a video of a young woman comedian at the end of this article that you may want to check out that illustrates what I am presenting in this article. So, please allow me to approach this gender issue one step at a time and hopefully you will understand why I harbor the beliefs that I do. First, let me say that funny is funny when a comedian is standing before an audience, regardless of gender (or race, creed, color, sexual orientation, palnet they are visiting from, etc.). And make no mistake, there are plenty of female comedians who can rock a room just like a male comedian can. So, where does this mentality that “women aren’t funny” come from? It starts at stand-up comedy open mics. If you go to ANY stand-up comedy open mic anywhere in the world, you will notice that the vast majority of open mic performers are men, not women. And just like their male counterparts, if they don’t really know what they are doing when it comes to developing and delivering a stand-up comedy routine that will actually get laughs, they will flop on stage. 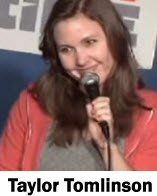 The important point to realize is that because there are usually so few women performing in any stand-up comedy open mic night show, they will immediately stand out if they bomb an stage, even though 5-6+ times as many male open mic comedians will have sucked just as bad (if not worse). This exact same mentality plays to the female comedian’s advantage when they are able to get the big laughs on stage. In other words, because of their lower participation numbers, they immediately stand out significantly among the very few male comedians who can actually get the laughs on stage as well. When you stand before an audience, what ultimately happens is between you and the audience you are performing for. Just like any other comedian, you are the master of your act, how it is developed and how it is delivered. You will get the big laughs, just like any other comedian who does the same. Let me introduce you to a young female comedian who is rocking the stand-up comedy world. Her name is Taylor Tomlinson and she is amazing in my book. Success in stand-up comedy is NOT about gender – it is about getting laughs – big and frequent laughs. And he or she who generates the laughs wins. End of story. This entry was posted in Editorial and tagged comedian, stand up comedy, Taylor Tomlinson, young woman comedian by Steve Roye. Bookmark the permalink.